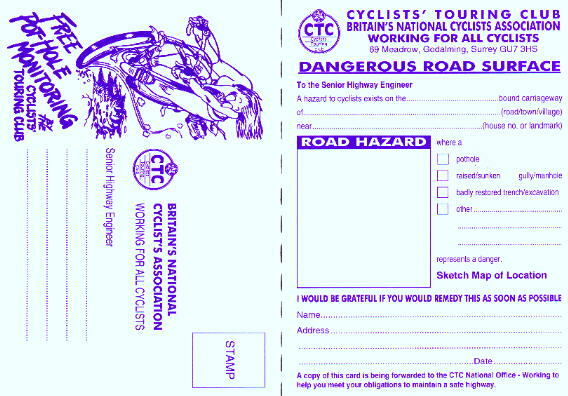 The CTC used to run a system which relied on cyclists filling in a 'Pothole Postcard' to advise local authorities of road hazards. This system has now been largely replaced by an Internet based systems operated either by the CTC or by local Authorities. The National CTC System called Fill That Hole and allows users to report problems anonymously - but this means that if the authority is unable to locate the problem it is not easy for them to request further information. The local systems are not anonymous - so you must be happy to supply contact information. For reporting road problems by phone or post see the list of Local Service Offices. This page was last edited on 12 April 2014, at 08:29.